Are you ready for a rescue challenge? 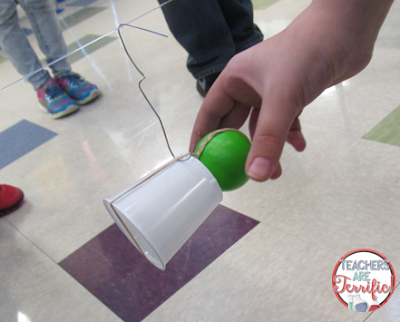 In that series, two groups were given the same supplies, built different things, and then joined the two things together! It was pretty spectacular! 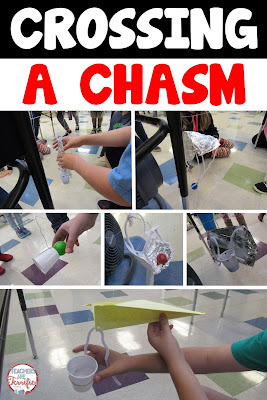 First, we learned how to say the word "chasm"! Do you know how? Here's the premise behind this challenge. The group is hiking and some of them make it across a chasm. They are stranded, however, without food. The other half of the team must devise a way to get food across the chasm. I added a twist to it. There is always a twist to make it challenging! I rigged up the apparatus above. 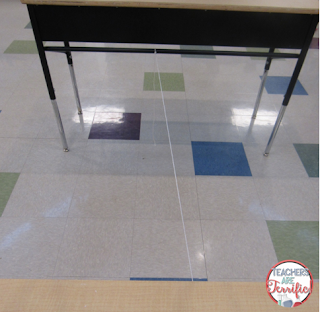 It's just two desks with a fishing line strung between them- four feet wide. 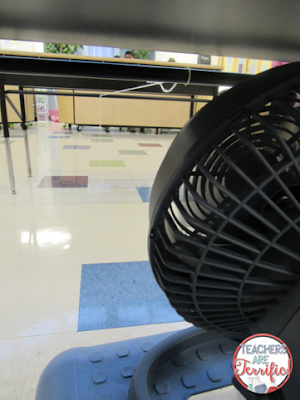 Then I added a fan sitting on the floor. It's aimed at the crossing line. 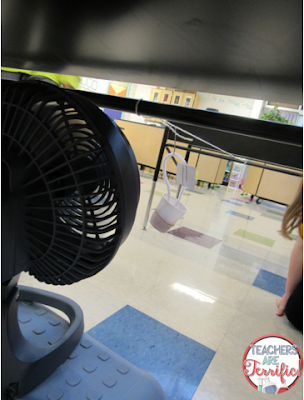 Now, the kids have to build something to hang from the line that the fan will blow all the way across! There's one going above. 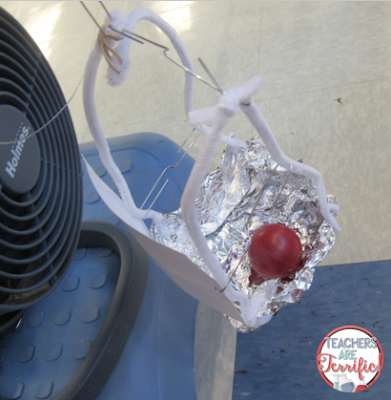 The kids knew right away that they would have to have something built that would catch the wind. The group above made a very tiny little sail. 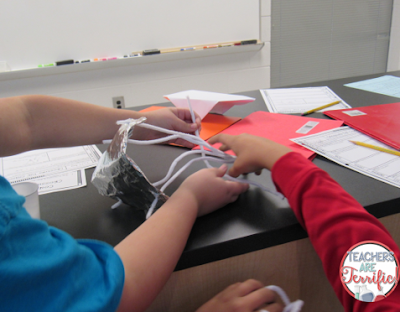 This group is making a parachute contraption! Will that work? It didn't go all the way! 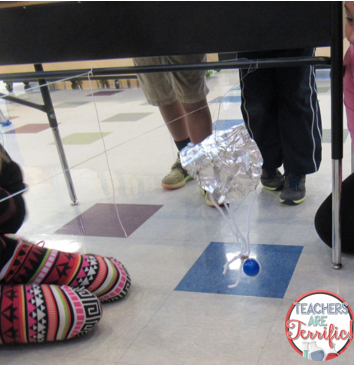 The problem the kids discovered is that a parachute can't catch the wind when it is facing the floor. It would have to be turned parallel to the floor. The group above thought the wind would just be driven into the opening of the cup and sail across. NOPE! The opening is too small and the device also tended to turn around backward. I LOVE THIS ONE! It looks like a ski lift chair. Sadly, it didn't work very well! 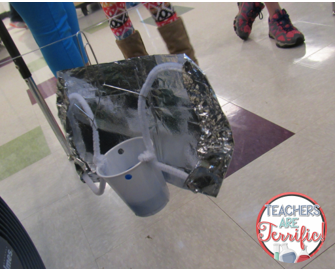 This group added a large piece of foil behind the food carrier and it worked fairly well. 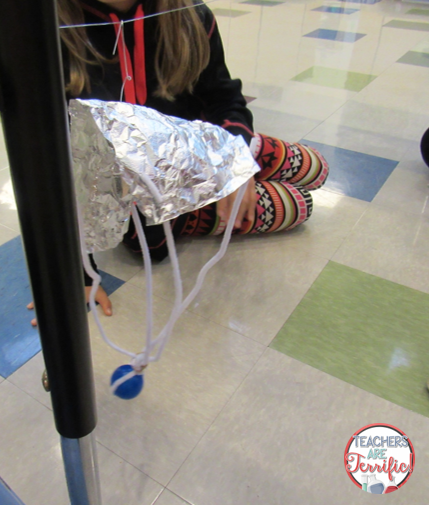 The foil is heavier than you would think! 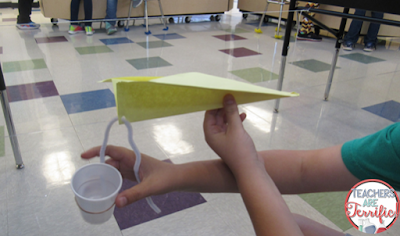 Finally, I had so many groups that thought a paper airplane would work! What do you think? So, that's our first (of a trio) of rescue challenges! We loved it. The kids would gather around the testing tables and encourage the devices to go-go-go and then cheer when they did. Believe it or not, one group made a contraption that sailed across in 5.09 seconds! One final thing! How do you say the word "chasm"? It's a hard C sound --kaz em! Can You Rescue Lego Man? 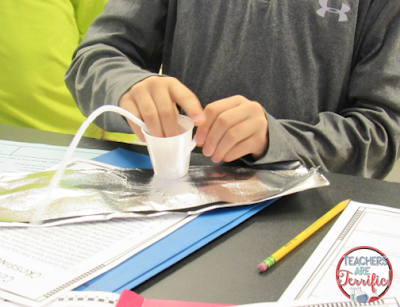 9 Ways to Enjoy Winter Vacation 2015!